This work presents an ontological model for the formal systematization and representation of knowledge that describes concepts from gamification and its use as Persuasive Technology (PT) in Collaborative Learning (CL) scenarios. This model enables the creation of intelligent systems that can personalize and apply the gamification techniques in group learning contexts in which the scripted collaboration decreases the motivation and engagement of students. 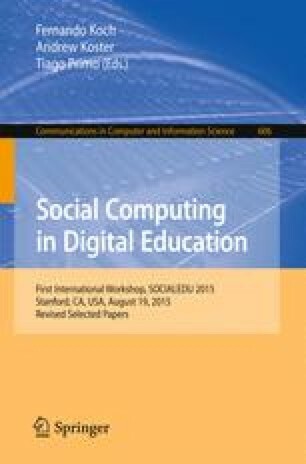 Thus, our approach proposes to formalize the connection of concepts from theories and models to design PT in order to specify gamified CSCL scripts that induce students to willingly follow an intended learning behavior. To demonstrate the applicability of our approach, we also present a case study that shows how our ontological model could be used by in an intelligent theory-aware system to build better personalized gamified CL scenarios. The authors would like to thank CNPq and CAPES for supporting this research.